*ANY STG2R REQUIRES CUSTOM TUNING. *THIS TURBO CAN NOT BE PUT ON AN LML. Dyno sheets attached under picture. This charger is truly amazing. You can run it on a stock truck, a mild truck, or a wild truck. Mark's in-person tune took my truck to an unbelievable level of smooth effortless drive-ability and explosive power. With a built trans and 40 over tips,my LMM held 25k+ rail, made 636/1100, and the spoolup is faster than stock - all on very modest pw and timing! Egt's are great and I still have my turbo brake! Prior to my dyno appointment, I did tire of the loudness (it's my family grocery-getter too! ), and I put back on the intake resonator. Combined with the 4" MBRP muffler and an FTE resonator, my truck is in-cabin quiet... but, roll down the windows and hear this thing EAT! 11+hrs to Danville and back were no problem. By far the fastest spooling and loudest 68mm Drop-In Charger on the market. Mark and Twyla are the easiest to get a hold of and are always honest with there advice. 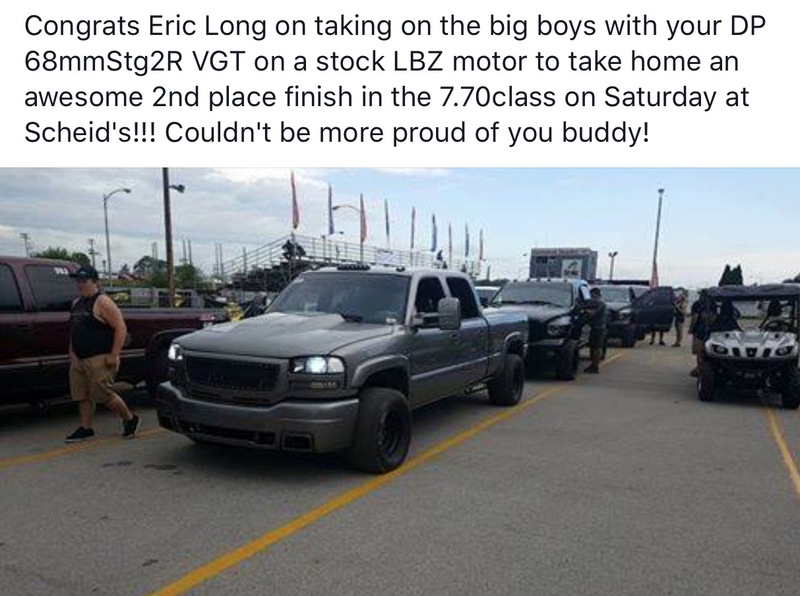 On a stock fuel LLY, truck pulls awesome and sounds crazy loud through the 5" Straight Pipe. Can't wait for high idle in the winter, neighbours are gonna love me! I think Chris summed it up the best. I put this thing on an LBZ and it's the best upgrade yet. I have a 5" MBRP with muffler, so the whistle isn't as loud, but everything else is as stated. I highly recommend the turbo to anyone wanting all around good performance. Best of all, Danville is the place to buy. This turbo is all around awesome. Very little lag. Nice loud whistle. Absolutely love the turbo and customer service! Highly recommended. Just Installed this on my LMM. The spoolup is Instant. Not like your typical 68mm or a lazy 4094. Turbo-brake is Very strong to say the least, strong or stronger than stock. Top end power is tremendous, it just keeps on pulling you in the seat! The sound is...Amazing! You can hear the "F16 Kill mode" from a mile away. 1450 egts on my max effort tune with 44% meth stock fuel system aside from lift pump. Danville tuned. If you want a weeekend warrior that will tow the camper, and spoolup like a stocker then this is the turbo for you! Click the button below to add the DP Billet 68mm Stg2R to your wish list.